From the Scooby Doo collection by Westland Giftware. 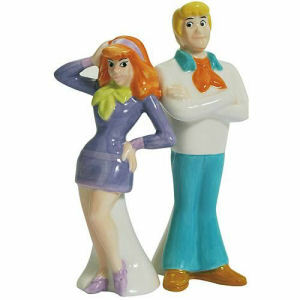 Scooby-Doo Fred and Daphne Salt and Pepper Shakers. This Item is in stock and ready to ship. You should not postpone your purchase and miss out on adding Scooby-Doo Fred and Daphne Salt and Pepper Shakers to your Scooby Doo collection! From the Scooby Doo collection by Westland Giftware. Scooby-Doo Fred and Daphne Salt and Pepper Shakers. This Scooby-Doo salt and pepper set measures 4.5 Inches tall.Made of ceramic.